Simply cooked. High fibre and protein. 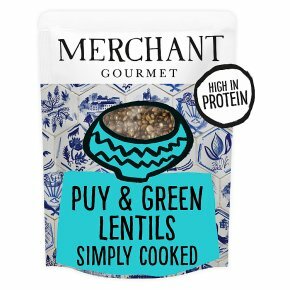 Suitable for vegans.These tasty lentils have a delicate, slightly peppery flavour, and were grown in Le Puy-en-Velay, in France. They've been simply cooked with water, onion, bay leaf and a dash of olive oil, and are a fantastic base for summery salads. Easy to prepare Squeeze the pouch to loosen the grains. For best results, heat through in a pan with a dash of water. Otherwise, tear a 2cm opening at the top and microwave for 45s at 900w, or simply enjoy it cold. Get creative For delicious veggie meatballs: press these cooked Puy Lentils into balls. Fry them and add to a pan of simmering tomato sauce. Cook for 20 mins and serve with pasta. Let's Cook...To eat cold: Serve straight from pack. Lay the unopened pack on its side and heat using the guidelines below.Microwave GuidelinesWatts: 900, Time (sec): 40Watts: 750, Time (sec): 60*Watts: 500, Time (sec): 120Leave pouch for 30 seconds then shake well before opening away from yourself to avoid steam.